1. Added Caffeine and Vitamins A lot of protein powders out there, especially the vegan powders or those marketed as ‘diet friendly’, include a number of added vitamins and caffeine that you probably want to avoid. Most pregnant women either already consume a pre-natal multivitamin or they have their micronutrient requirements met by food so having extra vitamins in protein powder is pointless (and can even be harmful as it leads you to consume more than your recommended daily allowance of specific vitamins). Caffeine is also a big one to look out for because guidelines for pregnant women dictate that we should limit our consumption of caffeine. According to the NHS, we should keep our intake of caffeine under 200mg a day. A study in Epidemiology notes that an intake of 200-350mg pose no risk. Keeping an eye on how much caffeine you’re consuming – and where it’s coming from – therefore becomes very important (here’s a guide to caffeine amounts in common foods). My advice here would be: track your intake of caffeine – bearing in mind that tea and chocolate also include it! – and avoid any and all protein powders with added caffeine. Stay away from ‘diet foods’ in general as these tend to often feature caffeine to boast their ‘diet’ claims by including green tea. 2. Sweeteners The ‘judge is out’ on whether including popular sweeteners like Sucralose (aka Splenda), Stevia, Xylitol, or sugar alcohols is detrimental to one’s growing baby. Some say YES! Others say NO! But the answer I think lies somewhere in between. That being said, I have made the decision to completely avoid them while I’m pregnant. The reason for this is that they have nothing to give me or my baby. We just don’t need them; we’re better off getting our sweet-tooth satisfied by eating a variety of fruits (which have the added plus of including vitamins and fiber!) or a properly natural sweetener like coconut sugar or agave. Not honey though, at least not unpausterized honey. Why? Because unpausterized honey poses a risk of food poisoning. It’s a tiny risk, yes, but a risk nonetheless. So why bother? Why bother when there are alternatives? That’s my approach to contradictory, muddy, or speculative guidelines like those concerning sweeteners (and unpausterized honey). 3. Fillers and (flavors) Fillers are things that are added to protein powders to add bulk, texture, or change the consistency of the powder when mixed into a shake. Here I mean things like guar gum, xanthan gum, palatinose, and other ingredients that are largely pointless, nutritionally speaking at least. I mean pointless in the sense that they have nothing to give me in terms of nutrients; they’re empty calories so to speak. Flavors too can be tricky because they too are nutritionally-void. Furthermore, natural flavors are often not at all ‘natural’ – not in the way you or I understand the word to mean at least. They’re chemically-processed materials ‘derived from nature’ and that can literally mean anything. They’re designed to make our tastebuds sing but that’s pretty much it. Nice-tasting? Sure. Beneficial at all? Nah. Harmful during pregnancy? Probably not but who knows? No one’s done the research. So, again, why bother? We don’t need them. 4. Sourcing When you’re growing a person, everything you eat becomes important as it’s going straight through to your little one. That’s why really paying attention to sourcing is key. Ask yourself: does the powder I’m considering buying (and consequently consuming) originate from a source that is free of chemicals, pesticides, or hormones? Is it organic? Sometimes finding out requires a bit of research but if the answer is at all no, well… you know what to do: put it down and pick up another one. Sourcing is very important when it comes to protein powders, particularly the dairy-based powders which are a byproduct of dairy. That’s because dairy can often contain traces of rBGH (bovine growth hormone) – not good. So, if you’re looking to buy a dairy-based powder, like whey protein, I’d recommend that you stick to one that’s organic and rBGH-free. If you’re choosing to go with a veggie powder instead of a dairy one, paying attention to sourcing is also important. Here, I’d say to go for one that’s organic and one which you can trace back to its source to make sure it’s suitable for both you and your baby. 5. Label Warnings A lot of protein powders out there contain a warning label stating that they should be avoided by pregnant or breastfeeding women. You’ll most commonly find these in powders containing things like caffeine, creatine, Taurine, Acetyl L-Carnitine HCL, Beta Alanine and/or, again, a percentage of vitamins that exceeds one’s recommended daily allowance (whether pregnant or not). These labels, in my opinion, are a good thing because we really shouldn’t be consuming a powder containing any or all of these supplements. We simply don’t need them and they can sometimes be harmful to our growing babies. But please don’t rely on warning labels to make your decisions because not all powders include them. What you should always do is make sure you read the powder’s ingredients’ list first, make sure you understand what’s in the powder, and pick one that provides you with as pure and natural a form of protein as you can find, nothing more. Protein powders, you see, are derived from food – whey comes from milk and pea from – you guessed it – peas. So there’s no reason why they should be considered unsafe. Most baby formula in fact contains whey! Albeit that derived from strained yogurt or raw/cultured milk and comprised of a different macro/micro nutrient-breakdown (one which boils down to approximately 59kcals, 2g protein, 0 fat and 13 carbs per cup – with about 25% calcium). Pea protein too is commonly found in foods geared towards the whole family, more so now than ever before! So don’t be erroneously swayed by the idea that protein powder are all de facto ‘artificial’ and consequently unsafe – because they’re not. Just make sure you always read the label and make an informed and educated decision. 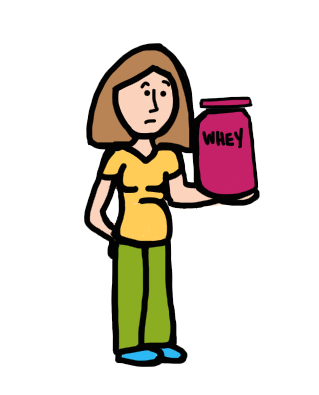 Summary In a nutshell, my approach to protein powders in pregnancy is this: You don’t need to avoid them. In fact, you can benefit from them. But always read the label and, ideally, choose one that has the least ingredients possible. Look for one that says: “Ingredients: 100% Organic Whey Protein” or “Ingredients: 100% Pea Protein.” Rice protein and hemp I tend to stay away from because the taste isn’t that great when it’s unflavored. I tend to stick to organic whey and organic pea protein. What to do I do with them? I cook with them! I made protein pancakes, protein bars, and protein cakes. Cooking with your protein powders is great because it allows you to not only benefit from the protein, but also integrate it with other nutrition-dense ingredients. Short on ideas of what you can do with whey or pea? Check out proteinpow.com (also check out the ‘sweetener-free’ category which includes the recipes made with unsweetened – and unflavored – powders). Disclaimer: This article is not intended as medical advice. Before taking any supplement, you should consult a qualified physician, especially because each woman – and every pregnancy – is different. Neither the author, nor the creators of this website, are medical doctors. This article is written for informational purposes only. ← Connect with Us on Facebook! that don’t have an ingredient list? Does that mean it’s JUST Pea Protein? It all so confusing…..thank goodness I have you to stalk and ask questions! If you’ve found any great 100% clean powders I would love recommendations……also does Organic Casein Protein Powder exist?!? !